Brighton have released a statement after crowd disorder at last night's match with arch rivals Crystal Palace resulted in fans with tickets missing the match and two stewards in hospital. The highly-anticipated clash was the first between the teams in the Premier League and ended in a 0-0 draw at the Amex. 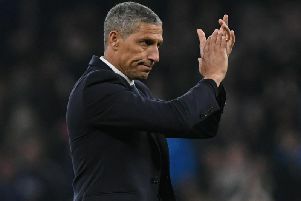 Around 150 fans with tickets missed the game and in a statement, Brighton said: "The vast majority of supporters who came to the match were a credit to both clubs - but sadly a minority came intent on causing disorder, which left several stewards with minor injuries, and one steward from each club hospitalised. "A number of Crystal Palace fans travelled to the stadium without tickets, arriving after kick-off, some with the aim of forcing entry into the away end at 7.48pm - three minutes after the match kicked off. "The club made the decision to close the turnstiles at 7.51pm - six minutes into the game - and with the support of Sussex Police, we made the further decision to let no further supporters into the ground in the interest of public safety. "A group of approximately 150 fans - some with tickets - were then escorted back to Falmer station, and onto Brighton Station, before being placed on a train back to London." Brighton chief executive Paul Barber said: “Firstly, we hope the two stewards hospitalised in the disorder have not suffered serious injuries. “The disorder was caused by a minority of individuals who attempted to gain entry to the stadium without tickets. “Thanks to the swift action of the club’s stewarding team, supported by Sussex Police, we avoided further, major disorder - and while some genuine fans were left extremely disappointed and unable to get into the stadium, the correct decisions were made. Albion's statement continued: "Brighton & Hove Albion will be sharing CCTV images with Sussex Police, the Metropolitan Police and Crystal Palace to identify the individuals involved in the disorder. "Genuine supporters, with tickets, who were unable to gain access to the stadium should contact Crystal Palace’s ticket office for further information regarding a refund. "As this matter is now a Police investigation, the club will not be making any further comment at this stage."